It's Labor Day season, time to honor the working men and women in this great land. And in particular, let's honor one particular type of worker: the barbecue cook. 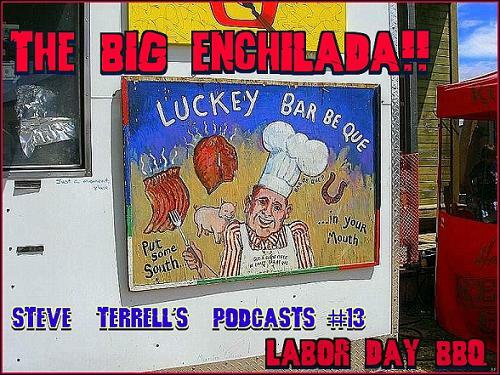 This podcast features songs of labor, songs of BBQ, plus a few side dishes in between. Artists here include The Waco Brothers, Jimmy Reed, the late great James Luther Dickinson, The Del-Lords The A-Bones, Los Peyotes, The Fuzztones, Mojo Nixon and many more. So come on down to the BBQ. Boy oh boy did this make mowin' the yard an absolute HOOT today! 1st I felt the pride of being the blood that oils the machinery of capitalism; then I rocked out a bit; and then I suddenly became as hungry as a Coal Miner - so much so that I grilled a whole bunch o' chicken out on the back deck while enjoying my earlier handywork in the yard. So many great tunes on this here eppy-sode! Great big tip o' the 10 gallon hat to that boy singing about the joys of Texas style BBQ. That Hank III tune was equally sharp - as I (believe it, or not) ain't to familiar with Hiram's grandson. And... thanks fer the kind words, too, Steve-O.